This could be a long day’s walk – not much short of 40km (25 miles) – or you could reduce it to half that length. Either way it is well worth it, for it is a beautiful route and a delightful destination at Lochgoilhead. For the long walk, see the cycle route below for details. However, if you take a bus from Dunoon round Holy Loch and up the Firth to Ardentinny (and there should be a bus at least hourly) you will reduce the walking distance to a more manageable 13 miles. Again, follow the cycle route from Ardentinny below (marked ***). A very enjoyable trip. Much of it is on quiet roads through attractive landscape, but you will spend an hour or so on some pretty rough forestry track. You may have to get off and push a couple of times. Leave Dunoon by A815 going north-west. Go round the head of the Holy Loch. Shortly after Orchard and petrol station (on the right) turn right for Kilmun along the A880. Go past Kilmun (perhaps stopping to look around the ancient kirk and the graveyard and to say hello to St Munnu), Strone (Gaelic sron ‘nose’ and hence ‘point, promontory’) Gairletter and Ardentinny. Go through the little village of Ardentinny *** and take the right turn at NS183882. 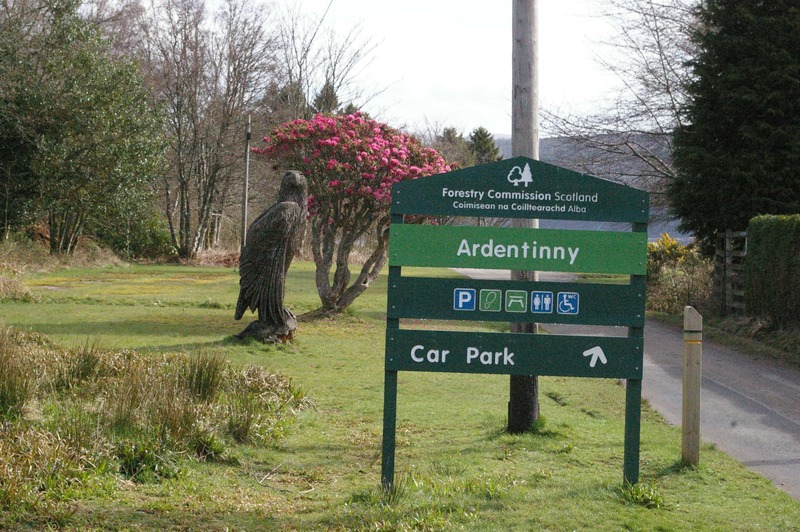 Go through the gate and follow the road for 200m or so till you get to the Forestry Commission signpost (and a huge wooden eagle sitting nearby). Forestry Commission sign and big bird: turn left. Turn left just before the sign. Now you are going up a forestry track, through the gap beside the gate, and up the hill for 640m. Turn right at the fork (NS186890), continue another 650m and take another right (NS192890) at a fairly large junction, big enough for large log-trucks to turn I suppose. 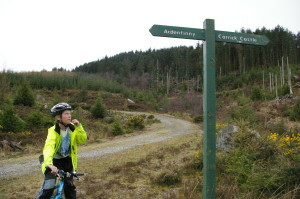 You will be taking the track marked ‘Carrick Castle’ on the signpost. Follow this for about 4km along the lochside. Then you will start climbing again. Pass under overhead power-lines carried by huge pylons, bear right at the fork at NS210920, continue up the hill until you come to a very small footpath (NS209923). Watch out for it. It is easy to miss, in spite of the signpost a little off the roadside pointing to Carrick Castle. Don’t miss the little footpath to the right off the main track. Otherwise you will go charging off up the hill to … who knows where? Take this small track through forest and down to the shore, along the shore to Ardnahein farm, then along road to Carrick Castle (a good place to stop for a picnic and a look about), and then about 9km along the road for the last stretch to Lochgoilhead. You’ll no doubt be hungry when you get there. The Goil Inn and the Shore House Inn both serve good food and drink, in this delightful little village at the head of the loch. And then you will feel restored, and your visit to the delightful Lochgoilhead Church (the Church of the Three Brethren) will inspire you. After your visit, if you want to return to Dunoon for the night, you can get the bus all the way back (by a different and also very attractive route, by Loch Fyne and Loch Eck). You can drive from Dunoon to Lochgoilhead. It’s a much longer journey than the cycling/walking trip, but an attractive one. Drive north out of Dunoon on the A815, along the east shore of Loch Eck, to Strachur. Continue north and north-east on the A815 from Strachur, through St Catherine’s, and shortly afterwards turn right along the B339 (though Hell’s Glen) which will take you down to Lochgoilhead and then to Carrick Castle. There are usually buses running between Dunoon and Lochgoilhead/Carrick Castle too. There should be several every day, but check local timetables for details.